CASS Shapewear V Neck Dress Slip shapes slims smoothes enhances. Shaping V Neck Dress Slip is the perfect foundation for wearing under silks and form-fitting knits. Slims torso and thighs, while smoothing from nape to knee. Supports up to a DD cup with or without a bra. The perfect foundation for wearing under silks and form-fitting knits. 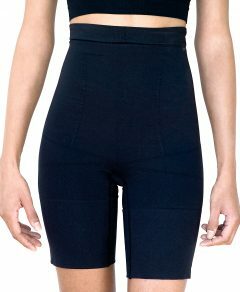 Slims torso and thighs, while smoothing from nape to knee. Supports up to a DD cup with or without a bra. Hemline stays put 3″ above the knee. Patented INVISUPPORT® lifts and enhances the bust up to D cup, while visibly slimming and smoothing the torso 360 degrees, eliminating bra lines and bulging. Breathable side panels keep you cool and comfortable all day and in every season.